Skintech Peels are a medical peel and can only be carried out by trained doctors and nurses. They are not available in the high street and should not be confused with very mild and gentle glycolic peels available from beauty therapists. Easypytic - 70% Glycolic acid with mendolic acid and phytic acid. Are they superficial, medium or deep peel? Superficial to medium depth peels. What skin problems do they claim to treat? The skintech peel range in combination with special creams can treat various skin conditions and disorders. They can be most effective in reversing sun damage, treating mild acne, reducing fine lines and wrinkles, removing hyperpigmentation, liver spots and other visible signs of ageing. They can be used on the face, the neck, the chest and the hands. Easyphytic and Easypeel can be used on all types of skin e.g. fine skin, normal skin or greasy or thick skin. It can also be used safely and effectively on black and Asian skin. There are a number of special creams available to be used in combination with the Skintech Peel range. Moisturising and Anti Oxidant Cream with Vitamin E.
Depigmentation and Anti Oxidant Cream (Bleaching and Blending). This depends on the type of peel used within the range, and also the type of problem that is being treated. Please discuss with your practitioner for more details. Erythema, and post-inflammatory pigment changes may be seen after a peel. Again, this depends on area treated, and the practitioner doing the treatment. (usually done in conjunction with easypeel to treat small areas of hyperpigmentation). 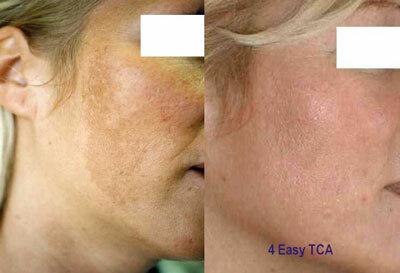 Photographs of hyperpigmentation on the face (left picture) before and after 4 Easypeels. Image provided courtesy of Euromedical Systems Limited. Click for ALL Skintech Peels clinics in the UK & Ireland registered and verified by Consulting Room.